No.289 – János Mikitovics – AUW in non-standard form! Isardam: The moves causing a Madrasi-like paralysis are illegal. This holds right up to the capture of the mated King. This is standard form of Isardam. I fail to see how this could work. Please, could someone comment at least one solution, what happens there? 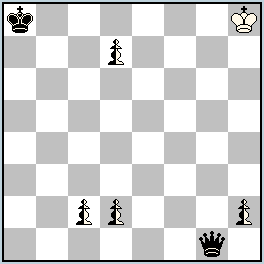 E. g. in final position of a) white royal queen attacks two neutral queens. So any move of black leads to illegal madrasi paralysis. All right, but then also the last move is already illegal as it leads to mutual attack of white and neutral queens, i.e. paralysis not allowed in Isardam. Why is that possible? Seemingly, the computer applies Madrasi for a Kobul Royal piece, but not only concerning the ‘observed’ pieces of the same type. When a Kobul Royal piece is paralysing two pieces, the whole board is paralysed?????? I must admit that’s best that can I understand without a very good explanation. When white to move all neutral pieces act as white. So no paralysis here. You can find the same logic in Fide Album 01-03 G208. It is not possible to say that with White to move all neutral pieces act as white. If this was truth, white could not capture neutral pieces. Rather it is important to stick to definition. It says, that neutral piece can be moved and captured by both white and black. Therefore mutual observation of wQ and nQ means total paralysis wQ (as nQ could capture wQ if played by black and wQ could capture bQ) and partial paralysis of nQ (white could move it, black cannot). In any case there is paralysis. So FA0103 G208 is OK in my view. Both half-paralysed mating nNs are paralysed for Black, they cannot move away, but still give check to bK as White can move them. In any case it just underlines there is paralysis involved and it is a continuous phenomenon, independent of whose move it is. What paralyses bQ, bK and nPh2? It seems like in Popeye interpretation only moves that lead to mutual paralysis is forbidden in Isardam. Kind of related to the “Isardam and en passant” issue discussed on matplus. But with Condition Isardam added there is no solution, although there is only one, one-way paralysis involved. So the problem must be somewhere deeper, I think Alex was close to good path with his explanation. It has to have something with the interaction of Isardam, neutral units and royal units inside Popeye engine. But the result is not only counterintuitive, but also not in line with definitions. It is indeed very interesting that Janos managed to show such intensive and united promotion theme under such strange circumstances. So no paralysis on white move for Popeye. Thanks for bare bone example! Intuitively, for me this is wrong, as I understand neutrals and paralysis. Well, any rule can be defined and even it is possible to say “my interaction of fairy elements works as in Popeye x.y”, but without giving details, this seems not to be in line with my neutrals and paralysis understanding. You can see that where is no logic at all! Janos has shown the spectacular possibilities of neutral pieces with “Popeye’s Isardam” – 3xAUW. There is also a trick with Kobulkings in 3 phases. My example has obvious weaknesses but the same point is present in 6 phases. If Julia adds a diagram, the solvers will be able to solve it. Thank you, Nikola! I appreciate your comments on the site a lot! But about this problem – should it be published as original? I don’t think it’s a version of No.289, although it’s inspired by it… But it’s up to you and János, of course! 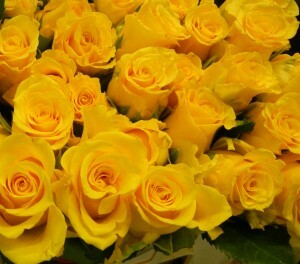 First I congratulate for a beautyful and exciting year of the site – incredible! Although it is a miniature, I think that my example has too big flaws to be published as an original composition. Extending AUW to 6 pairs of pieces might be a task which would justify the flaws, but not when the conditions like Madrasi or Isardam make it too easy. Together with Janos’s original (which has no such flaws), my example asks a question – is Popeye’s Isardam a standard interpretation of this condition (concerning the netral pieces) or it could be accepted as a new variant of Isardam? Some people believe that in the future, the standard chess will regularly have Nightriders instead of Knights. In such case, the problem above would present the Babson task. This should not be a question, Nikola! Of course, these versions are your own original problems. In the example (3+3+1), bN and bG are almost completely artificial and superflouos. I would prefere to avoid their presence on the diagram, saying simply that the promotions to N and G are allowed. But then, bNa4 would be needed to prevent the cooks. So, I don’t think that it is decent enough to call it the original problem. I don’t like the 0-p. in general, but I think, here is justified because it ensures the most economical structure. Janos, put wK in your last version on e8 (or b8,c8,d8) and you will know how I came to the example with bN and bG with 2×3 solutions. Remove bNa4 and wPb3 from that example and there are 3+2 pairs of promotions. Why would we look for 0-position with 5 pieces and only 4 pairs of promotions? I mentioned those other possibilities without 0-position, especially with rotations, because you perhaps could find some possibility in it which I was not able to see. In Popeye 4.59 fairy condition Kobul Kings doesn’t work correctly with neutral pieces. I hope this is corrected in the newest version of Popeye. In case you need to check Kobul Kings with neutral pieces please use WinChloe. But Popeye’s gives interesting possibilities because a Kobul King can get some neutral features. Janos nicely showed it in 3 phases. If Popeye’s approach to the Neatrals could be well defined and consistant, it might be a new type of Isardam.